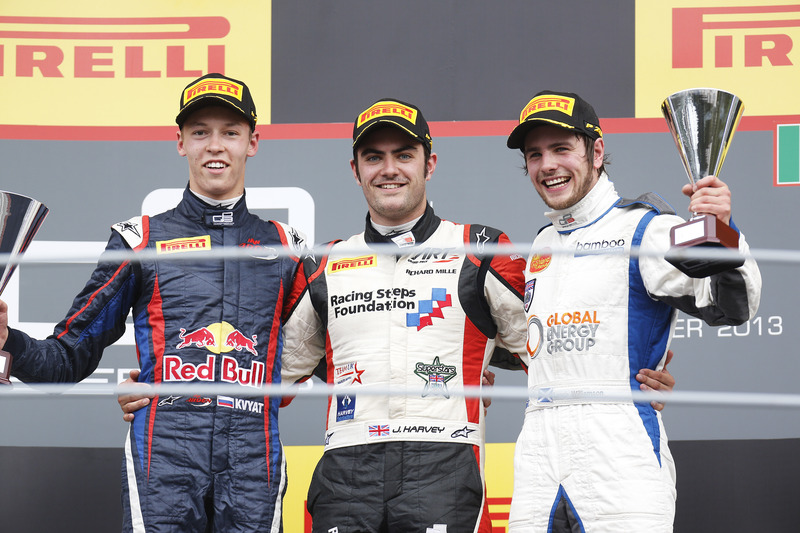 Jack Harvey took his second GP3 race win of the season at Monza, in a race marked out by several accidents. The Englishman took a keen victory ahead of championship contender Daniil Kvyat and the revitalised Lewis Williamson. Harvey assumed the lead immediately when polesitter Patric Niederhauser stalled from his top spot. His lead rarely stretched beyond one second and his mirrors mostly full, yet the Art Grand Prix held his nerve to take an impressive win ahead of a feisty Kvyat. An early safety car period following two separate crashes prior to the Rettifilo chicane ensured the field was clasped together in the initial running. It also gave Williamson an opportunity to jump up to the top four, with a mistake by Alexander Sims promoting the Scot into 3rd place on lap 3. That became 2nd place when Williamson fought his way past series leader Facu Regalia three tours later; however Williamson could not hold the pace to Harvey for the duration, allowing the charging Kvyat to swing around the outside and into 2nd place three laps from the end. Kvyat had an indifferent start, but made the most of the running when the safety car pulled in at the start of lap three. From there, the Russian drew past Sims, Kevin Korjus and Melville McKee. Korjus retook Kvyat on lap four, starting a five lap ding-dong from which Kvyat would eventually prove victorious. Moves on Regalia (lap 13) and Williamson brought the MW Arden racer close to Harvey, but the Russian ran out of laps to pressure the race winner. Regalia eventually assumed 4th spot, after several laps holding Korjus, Carlos Sainz Jr and Sims at bay. As the pack mixed amongst themselves, Regalia eased to the line, with Korjus (5th) in arrears, while Sims nabbed 6th from Sainz Jr two laps from the end following an error by the Spaniard. It also allowed Melville McKee through in to 7th, while Conor Daly came through to claim the final point after a monster drive from the back. The race was peppered with some huge – and rather worrying crashes – most notably a penultimate lap smash between Samin Gomez and Adderly Fong, which saw the former move in the braking zone squeeze Fong to the wall on the start finish straight initiated a huge shunt that ended with the Status destroyed and minus a wheel at the Rettifilo chicane. There was much carbon fibre debris following the opening lap, when a stalled Niederhauser was collected heavily by Alex Fontana. In a separate incident moments later, Ryan Cullen ran over the top of David Fumanelli, before also collecting Emanuele Zonzini. Also a rear wingless Jimmy Eriksson collected Nick Yelloly on lap three, pitching the Englishman into a shut at the Parabolica.